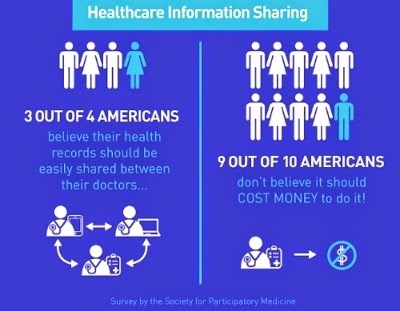 Not Running a Hospital: America says, "Let MDs share my data--for free!" 1. Privacy/security of personal health information. Currently, motivated attackers often are able to gain unauthorized access to a system through numerous means, whether they are trojans, social engineering, etc. Data breaches and unauthorized access WILL happen--see the numerous corporate data breaches just in the past year--so will people be willing to accept the increased risks from interconnected systems in exchange for more open communication? Personally, with our current tech climate, I operate on the assumption that somebody could get access to my records if they really tried. 2. Lack of health IT standards. This is something that I work with ASCO on. The process of developing standards for different software platforms in healthcare is still in its infancy, and standards will be important to allow different systems to communicate with each other, unless a platform such as Epic just swallows up everybody. Additionally, there will be a cost to implement these changes. Who will pay for it? I'd think insurers/payors would have an interest since shared records could prevent duplicate tests. This is somewhat dependent on the benevolence of the keeper of this repository, let alone malicious attackers. Public opinion could shift rapidly upon evidence of malignant use of their personal data. Make no mistake, there will be pressure to use this database for employment screening, underwriting evaluations, legal discovery, and data mining ad infinitum. But there would be no way to recall your PHI, to retroactively opt-out. People will not tend to self-report or seek treatment for activities and conditions that could later be used against them, thus affecting the practice of medicine itself. People do not yet know just how much "meaningful use" opts them in to this system without real informed consent. New, enforceable, and unambiguous safeguards are needed. The AAPS "Bill of Rights" http://www.aapsonline.org/patients/billrts.htm is a good start.